The pay charts below reflect a pay raise of 1.6% and show MONTHLY pay for Enlisted servicemembers in the Military. Members are paid twice a month on the first and fifteenth, therefore you will receive half of the amount listed below on each payday. 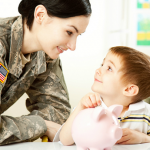 The pay scales below are for active duty in the Army, Navy, Air Force, Marines, Coast Guard and National Guard.